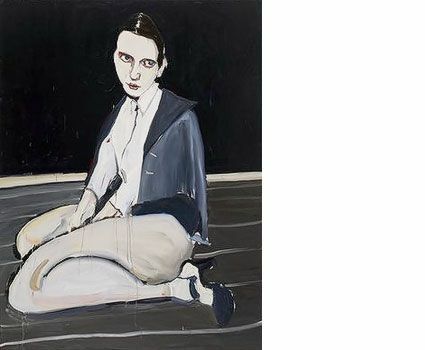 Victoria Miro is delighted to announce an exhibition of new and recent paintings by Chantal Joffe. The show centres around a powerful group of seven large-scale paintings where the artist has restricted her palette to dark tones of black, red, blue and white. The works offer complex fictional portrayals of the artist's heroines painted chronologically and moving towards us in time from the 1840's. As well as conceptual explorations of representations of female icons, the works also engage with key moments in literature, painting and feminist history. Both specific and non-specific, these are imagined depictions of women - some are real individuals and others hybrid figures - born out of Joffe's consideration of works of art and literature and the social climate in which they were created. Manet's The Drummer Boy, the writings of Emily Brontë and Emily Dickinson, the paintings of Lee Krasner and Tamara de Lempicka are all referenced here along with the intimate musings of Edmund White and the passionate polemics of Susan Sontag. Each painting shows these young women at a point early in their lives, when they are beginning to find a voice and question what it means to pursue a dream of being an artist. Set against dark backgrounds and located somewhere not of this time, the strongly contoured bodies are depicted in awkward or sexual poses, distorted or kneeling but equally conveying a sense of vulnerability. The models - as is often the case in Joffe's work - are taken from photographs in contemporary fashion magazines and bear little or no resemblance to their imagined counterparts. The series begins with a portrayal of a young androgynous girl which formally pays homage to Manet's strong black outlining of figures, drawing attention both to the surface of the picture plane and the paint. Next, Emilys Brontë and Dickinson merge into the single likeness of a young 19th- century author, whilst positioned later, in the 20th- century, a depiction of Lee Krasner suggests an alternative to the machismo world of abstract expressionism and the works of Krasner's husband Jackson Pollock and other mid-century male figures whose language so dominated the art world that many women artists were overlooked for decades: Louise Bourgeois, Alice Neel and Krasner to name but a few. Further into Joffe's series lies the influence of minimalism and post-painterly abstraction of Frank Stella, whose stripes become the backdrop for a young female beatnik. The exception to the series is the last painting, a portrayal of intellectual and activist Susan Sontag as a young woman alongside a heavily blacked-out male figure, again symbolic of the contributions to contemporary culture made by a woman in a predominantly male-orientated world. Characterised by Joffe's fluid style and deliberate distortion of scale and form that exudes psychological and emotional force; the restricted palette adopted in this series of works results in a presentation that is both looser and freer. Left deliberately untitled, these works are not portraits of single personalities but rather paintings, loaded with symbolism, acknowledging the rich history of the creativity of women who have profoundly impacted literature, artistic practice, and cultural thought.